You are here: Home / Food / The Scotch Pie also Kwown as "Football Pie"
Whenever you want to find out what a popular local fast food is just check out what’s being sold at the local favourite sporting event or any large outdoor event. In the case of Scotland, Scotch pie is the favourite Scottish food. It has a cult following at football matches and in fact Scotch pies are sometimes referred to as “football pie”. Traditionally, the Scotch pie was made from minced lamb or mutton, but these days minced beef is the main meat used. The meat is mixed with a spicy seasoning before being baked in a pie shell. Of course the quantity and type of spices used are closely guarded secrets of individual bakers and butchers. The other names for Scotch pie are mince pie, mutton pie, savoury pie or shell pie. So how is the Scotch pie different to other pies like the steak pie or steak and kidney pie. 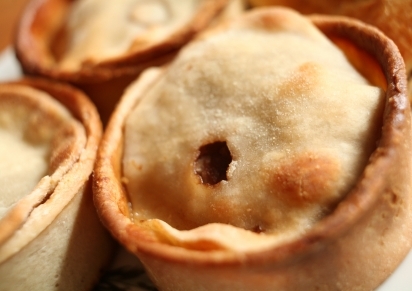 Scotch pies are savoury double-crust pies baked in straight-sided moulds that are about 4 cm high and 8 cm in diameter. The hard crust of the pie allows it to be hand held without any wrapping. This makes it a convenient hand held snack at any outdoor events. The Scotch pie can be eaten cold or reheated in the oven. If served as a meal, it can come with gravy, mashed potatoes or chips, mushy peas or vegetables. In Scotland, Scotch pies can be bought from the butchers or grocery shops. The Scotch Pie business in Scotland takes itself very seriously and each year the Scotch Pie Club holds a World Scotch Pie Championship. The butcher or baker with the tastiest pie is awarded the World Scotch Pie Champion. So if you are partial to meat pies and want to know who bakes the best Scotch pies, stay tuned in to the annual Scotch Pie Club’s championship awards (www.scotchpieclub.co.uk). And then, there’s also a annual British Pie Awards. I think everything butchers can make to improve the quality and taste of meat pies should be awarded. I am third generation of Scottish, born and raised in New Jersey (USA) running a Scottish shop, and I have seen this is true. Our customers think our pies are the best!